One of the challenges for a file systems filter driver in the Windows NT, 2000 or XP environment is knowing precisely when it is â€œOKâ€� to discard per-file state information. While it is customary for file system filter drivers to track such state based on the FsContext field of the FILE_OBJECT, the new file system filter driver writer may be frustrated to find that some I/O operations are missed. First, it is worth reviewing the reason that reference counting is not a trivial exercise for file system filter drivers, then weâ€™ll review the various cases that any algorithm must take into account, and finally propose our algorithm for tracking references to the per-file data normally maintained by a file system filter driver. In analyzing the various algorithms available for tracking this information, we noted that there may be cases where the techniques used can be simplified. And thus we describe two separate algorithms here â€“ one that is useful for tracking state in the general case, and a second case that is useful when only data operations are of interest to the file system filter driver. For a file system filter driver that must track all instances of a file object, this unfortunately results in the need to not only track reference counts, but also to track the specific file object for which it has observed and IRP_MJ_CREATE. Such a filter must typically maintain both a reference count (for file objects seen via the IRP_MJ_CREATE mechanism) and an explicit list (or other data structure for tracking these file objects) of stream file objects seen by the filter. Thus, on each I/O operation, the filter examines the FO_STREAM_FILE bit in the Flags field of the FILE_OBJECT. If this bit is set, the filter verifies that the file object is in its list â€“ if not, it allocates the necessary storage for its tracking information and inserts it into its list. Then, when it observes an IRP_MJ_CLOSE operation, it will either decrement the reference count or remove it from the list, as appropriate. Only when both the list is empty and the reference count is zero does the filter delete the tracking data structure. Thus, the filter must create the per-file tracking information whenever it observes an IRP_MJ_CREATE or a stream file object for a file for which it does not have tracking information, as a file object may be created entirely internal to the filter driver or because of an application programâ€™s request to open the file. The filter driver must still attempt to determine the appropriate action with respect to tracking such files, which can be difficult. In the â€œsimplifiedâ€� algorithm that we describe later, we will suggest a technique for keeping the context even longer to allow the filter to avoid re-evaluating the need to track the given file. If an application opens the file initially, the filter driver would create the per-stream file context information at that point. If it then subsequently observes an I/O using a stream file object, it will not find it in its list, and will create a new entry. Then, regardless of the order in which the IRP_MJ_CLOSE operations arrive within the filter driver, it will not delete the per-file context until they have both been processed â€“ the reference count will then be zero and the list of stream file objects will be empty. The problem with this scenario is that because the filter has deleted its per-file context information, the subsequent write operations are missed by the filter because they do not appear to be relevant. Of course, using the previous algorithm we described, upon observing the new paging I/O operation the filter would create the per-file context information (again) and then ascertain if the file should have been tracked in the first place. While this will work, we can simplify the process by adding an additional check for this case â€“ specifically, before deleting the per-file context, the section object pointers from the file object must both be NULL. Otherwise, we know that there is some file object backing the section and it has not yet been observed by our filter driver. This works because the reference count represents the user-level opens against the file. The reference count is decremented only when a user-level file object is closed (as evidenced by the FO_STREAM_FILE bitâ€™s absence in the file object) and thus there are no user references to the file when the reference count is zero. 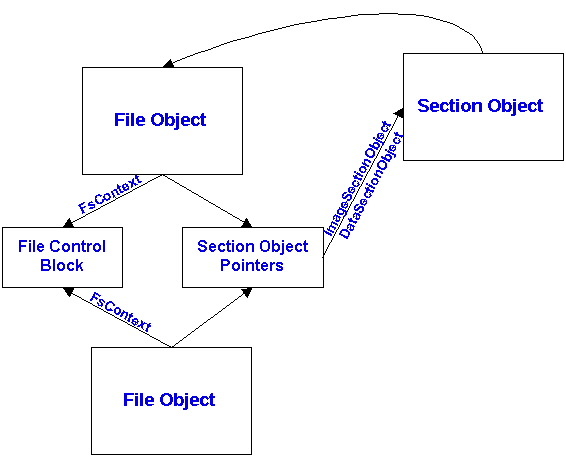 Similarly, the section objects represent the VM state for the file. If these two section object pointers are NULL there are no VM references against the file â€“ hence, no memory mappings of the file, whether by applications or the cache manager. Since the filter is only interested in data operations, this is sufficient. Any new data operations will require that the file be re-opened. Do note that this algorithm only works if your filter observes all operations against this file - if you dynamically load your filter driver and the file has already been opened prior to that, this algorithm will not suffice.